* Only use 1/2 tsp salt if you’re skipping the butterscotch spread. Mix flour, baking powder and salt in a small mixing bowl, set aside. Beat sugar and softened butter until smooth. Add eggs, syrup and vanilla, beat until smooth. Add flour mixture to egg mixture and mix just until just blended. Fold in pecans. Divide dough into two pieces. Form into long flat loaves about 1/2 inch tall and 12-15 inches long. 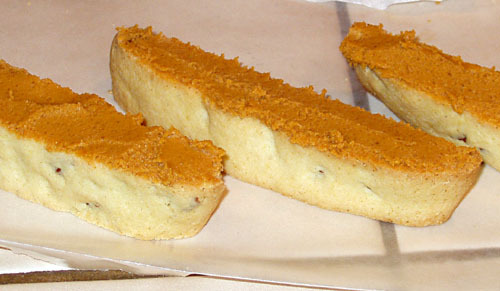 Place the loaves 3-4 inches apart on a prepared or non-stick baking sheet. Bake for 30 minutes or until golden brown. Let cool for 10-15 minutes (or until you can handle the loaves without burning yourself) on a cooling rack or cutting board. With a serrated or extremely sharp kitchen knife, cut diagonally into 1/2 inch thick slices. Lay the slices flat on the baking sheet. Bake for 15-18 minutes, turning over once. Transfer to a wire rack to cool. Melt butterscotch chips, brown sugar and butter on low in a double boiler on the stove or on low heat in the microwave, stirring frequently. Spread warm butterscotch mix across the side or bottom of biscotti. Transfer to wax paper to cool. The butterscotch chips were apparently more packed with sugar than I anticipated. This makes for an incredibly sweet and somewhat “thick” spread instead of what I’m used to with chocolate. Next time, I’ll not be using any brown sugar. It still cooled and became solid, but I’d much prefer to dip or drizzle it over the top of the biscotti instead of having to spread it on like peanut butter. 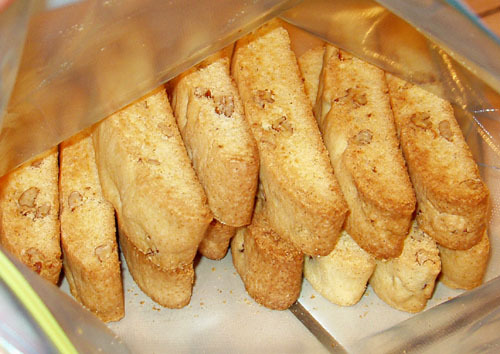 The biscotti tastes pretty darn good without the butterscotch. Total time: 1 hour, plus overnight chilling. The June 2010 Daring Cook’s Challenge was hosted by Evelyne, of Cheap Ethnic Eatz, and Valerie, of The Chocolate Bunny, and they chose delicious pâté with freshly baked bread. I served my vegetable pâtés as individual pâté instead of a layered block. I’ve included the red pepper recipe I skipped, as well as my version of the other two layers. Boil beans in large saucepan for 30-60 minutes, until soft. Drain thoroughly. Mash beans in large bowl. Add lemon juice, olive oil, oregano and garlic and blend until smooth. Season to taste with salt and pepper. Spread bean mixture evenly on bottom of prepared pan. 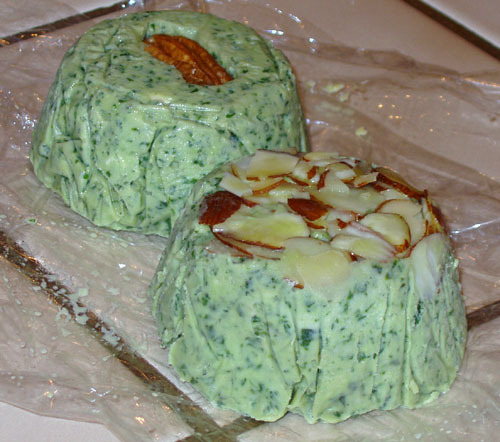 I lined my cupcake tin with saran wrap, placed pecans and almond slivers in the bottom of some cups, then filled them with bean, pea or pesto mash. After chilling in the refrigerator overnight, I gently flipped them out onto my cutting board to make cute little mini pâtés. I kept them in the freezer until an hour before I was going to use them. Over the course of few weeks, I tried each of these with pita bread, whole wheat bread toast, and a variety of crackers. The bean layer tasted best with some cream cheese on a pita, and the pesto layer tasted great on everything (I love basil and pine nuts). Adapted from Sesame Sweet Pea Spread in 356 Ways to Cook Vegetarian by Kitty Morse. In a medium saucepan over medium heat, melt butter and cook onion and garlic until softened (3-4 minutes). Add peas, sherry, and salt. 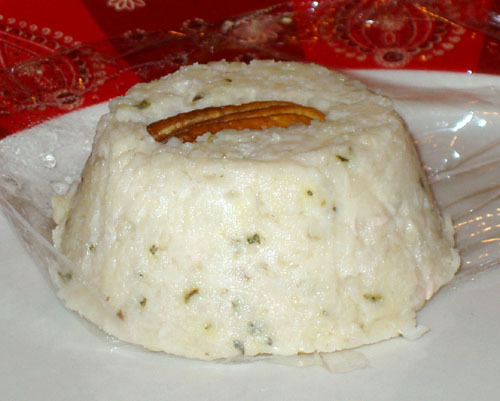 Cover, reduce heat to low, and cook until peas are soft (4-5 minutes). Stir in lemon juice, and let cool 5 minutes. 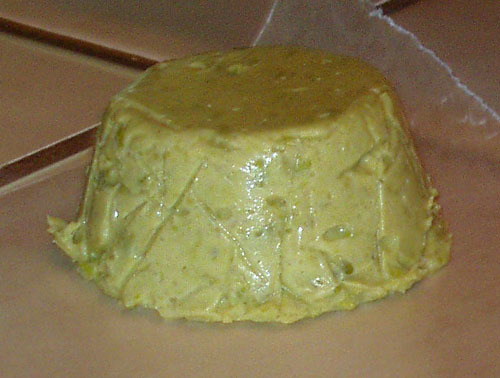 In a blender or food processor, puree pea mixture. Add tahini and process until well blended. Serve chilled, formed or not. 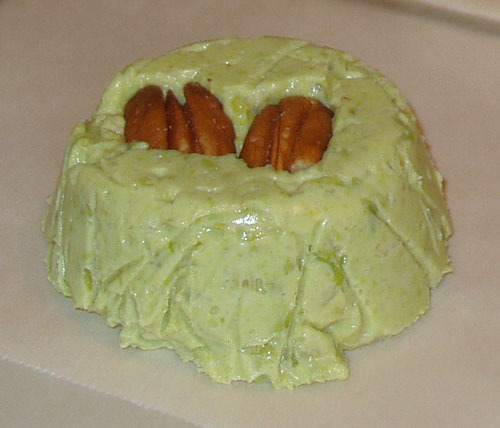 I lined my cupcake tin with saran wrap, placed a pair of pecans in one cup, then filled them with pea mash. After chilling in the refrigerator overnight, I gently flipped them out onto my cutting board to make cute little mini pâtés. This was the recipe I selected instead of doing the roasted red peppers from the DC challenge recipe. Maybe it was the sherry, maybe it was the tahini, I’m not quite sure, but something just didn’t seem right tasting to me after it chilled in the refrigerator. I liked it better warm, as a spread, than cold as a pâté. Breads and Desserts, Breakfast, Cuppylicious! Warning: Cinnamon rolls take time – lots of time. The following recipe is 4-5 hours or overnight. This recipe is supposed to make 12, but I always end up with 16-20 rolls. Scald 1 cup of milk (I like to put it in the microwave on high for 30 seconds, stir, on high for a minute, stir, then on high again for 30 seconds). Add shortening, stir well. Set aside to cool to room temperature (about 30 minutes). In a small bowl, combine yeast, water, and 2 tsp sugar. Let sit for 3-5 minutes or until frothy. In a large mixing bowl, combine white sugar, eggs, and salt. Add cooled milk mixture, mix well. Add yeast mixture, mix well. Add flour, mix well for 3-5 minutes, until all the flour is completely incorporated. Transfer to a lightly greased bowl, cover, and let rise until doubled (3-4 hours). Lightly flour the surface of the dough and your hands. Turn dough out onto a lightly floured board. You might want to lightly flour your rolling pin, as well. Roll dough to a thickness of 1/4 inch, rectangle optional. In a small bowl, mix brown sugar and cinnamon until the color becomes a uniform brown. Spread the surface of the rolled dough generously with melted butter. Sprinkle cinnamon mixture as evenly as possible across the surface. Follow suit with pecans and/or raisins. Bake 15-30 minutes in a 375F oven, until tops are golden brown (eggwash optional). Just keep an eye on them after the 15 minute mark. I use the middle rack. When I bake 4 in my 8 inch brownie pan, I only bake them for 15 minutes. Same thing if I squeeze them into a circle on my cookie sheet. When I put 8 in my lasagna pan, I have to bake them quite a bit longer, hence the “15-30” minute range on baking times. 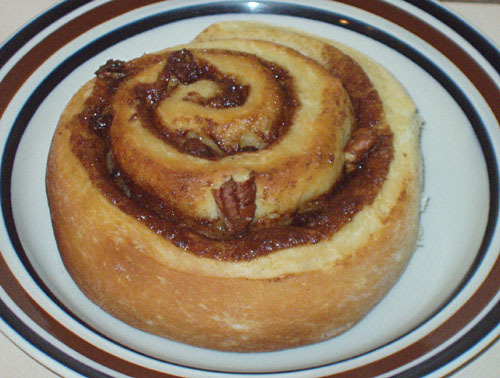 Check out Joy the Baker’s photos here for step by step instructions on how to roll, sprinkle, and prepare cinnamon rolls (not to mention a much sweeter recipe).